Design Within Reach, the largest retailer of authentic modern furniture and accessories in the world, today announces its return to the Long Island market with a new retail location in Manhasset, New York. The company previously operated Studios in East Hampton and Roslyn on Long Island, but their small retail footprints could accommodate only limited assortments. 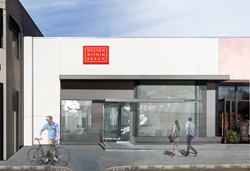 The new DWR Manhasset Studio, which will be adjacent to Apple on Northern Blvd., looks to provide design enthusiasts with 12,000 square feet of engaging design innovation and exceptional client experience from best-in-the-industry design account executives. Founded in 1998, Design Within Reach made modern design accessible to the U.S. market through its groundbreaking catalog and e-commerce site and has evolved into a destination for its exclusive collection of modern furniture and accessories to complement the iconic midcentury classics it has offered for years. The experience at the new DWR Manhasset Studio will be unlike that offered by any other furniture retailer on Long Island. Situated across two spacious floors, a glowing installation of hundreds of pendant lights called a Light Cloud welcomes customers to the space and invites them to discover DWR's extensive product assortment. Twenty-four fully realized room vignettes integrate iconic, authentic classics of modern furniture with DWR's exclusive collections and the work of designers including Charles and Ray Eames, Chris Hardy, Egg Collective, George Nelson, Jens Risom and Norm Architects. Customers looking to individualize their décor will love the Swatch Wall (itself a piece of beautiful design), which shows off more than 300 of the thousands of upholstery options available from the likes of Maharam fabrics and Edelman® and Spinneybeck® leather, and the opportunity to see how products will look in their own homes using the DWR 3-D Room Planner. The new Manhasset Studio will also showcase an extensive assortment of DWR-exclusive outdoor collections for lounging and dining as well as a dedicated area to test task chairs from Herman Miller®, Knoll® and Humanscale®. "We're thrilled to be back on Long Island with an innovative space that truly allows us to show customers how to live with authentic modern design," says John Edelman, CEO of DWR. "Long Island has a long history of architectural excellence, and we look forward to sharing our passion for modern design." DWR continues its partnership with New York-based architecture firm D Form A (DFA) to bring the Manhasset Studio to life, as well as enlisting the help of Light Studio LA in creating dramatic lighting design throughout the space. DWR Manhasset Studio, located at 1900 Northern Blvd., Manhasset, NY 11030, is expected to open in spring 2016. Design Within Reach is hiring: dwr.com/careers. Design Within Reach, Inc., founded in 1998 and headquartered in Stamford, Connecticut, is the world leader in authentic modern design. The company sells its furniture and accessories to residential and commercial customers through retail Studios in North America, via the Web at dwr.com, by phone at 1.800.944.2233 and through the Contract division at dwrcontract.com. For additional images and information, contact Kim Phillips at pr(at)dwr.com.